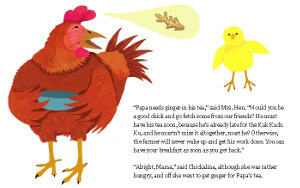 This charming, illustrated book introduces beginner readers to Chickalina, a good little chick who likes to help her parents, Papa Rooster and Mama Hen, whenever possible. 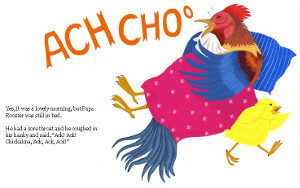 In this story, Papa Rooster has a bad cold and something must be done so that he won't miss the Kuk Kudu Ku when the sun rises. 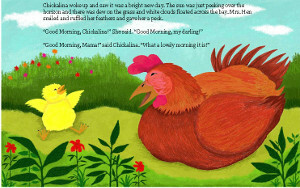 This is the first of a series of Chickalina picture books, featuring Chickalina's family and their various animal and human friends. Wild animals, domestic animals, farm animals (none of whom are ever, ever, ever, eaten!) and civilized human beings predominate in these wonderful children's books. Children and grown-ups will love the beautiful, full-color picture book illustrations by author and illustrator, Sonal Panse.